Sun Mountain's newest cart, Reflex is distinguished by its innovative four-step folding method. When open, its wide stance is extremely stable. When closed, it has a small footprint. The deluxe accessory console includes two padded valuables trays, separate storage for golf balls and a beverage holder. Patent-pending design easily unfolds and folds, fitting easily into car trunks. Wide wheel base for superior on-course stability. The E-Z Latch System simplifies folding and unfolding the cart and adjusting the handle height. Push handles have 180 degree range of adjustability for comfort, convenience and choice. Accessory console with dual, padded accessory trays with ball rack, score card holder and beverage holder. 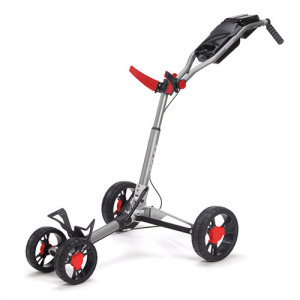 Folded Dimensions: 25" X 15" X 11"
If you have any questions regarding the 2015 Sun Mountain Reflex Golf Push Cart, please give us a call, we would be happy to help you with any questions you may have. Write an online review on the 2015 Sun Mountain Reflex Golf Push Cart, and share your thoughts with others.